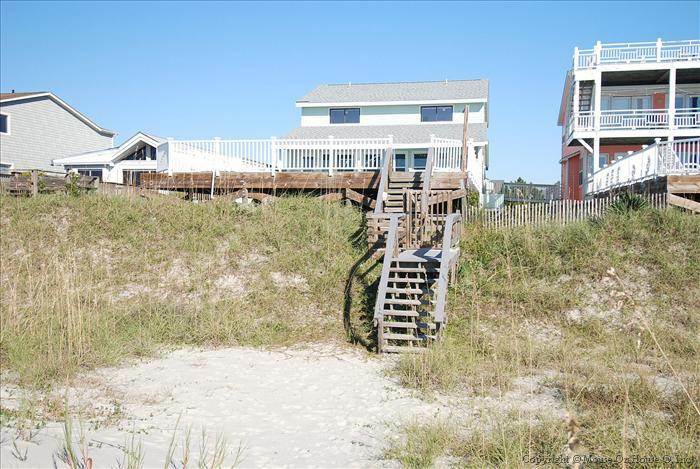 OCEAN FRONT 6 Bedrooms, 4 Baths with extra-large pool at deck level. Sleeps up to 22. Spacious living area with large dining area that can seat the large crowd at meal time and 2 dishwashers to handle the clean-up. Wet bar with Icemaker, 2 highchairs and full crib for the young guest. Unlimited domestic long distance, wireless internet access, on flat panel TV and one DVD player, breezy ceiling fans, charcoal grill, outside shower, covered porch with porch furniture. Non-smoking and no pets. Upstairs: 2 Doubles, 2 Doubles, 2 Doubles, 2 Doubles. This is a BLUE RIBBON property and all beds will be made and bath towel sets provided for the occupants. Golfers welcome. Golf packages are available through Sloane Realty Vacations. We especially enjoyed the deck and pool. The house was well supplied for a family of eleven.